The Japanese yield curve reveals the true state of Japanese monetary policy over the last 20 years. Has it really been ultra loose as suggested by the low short-term rate or more moderate? Examination of the Japanese yield curve also has implications for the West. Is the West following the same policies as Japan and headed for 20 years of stagnation or are these countries following a more extreme path? Is The West Following Japan? The argument we hear is that the US is going down the same road as Japan: loose monetary policy will have no impact because banks are not willing to lend. Ultimately we will have a lost decade of sluggish growth and “deflation”. So how does the claim that the West will undergo a similar experience to Japan stack up in practice? Was Japanese monetary policy as extreme as what we have seen from the US? 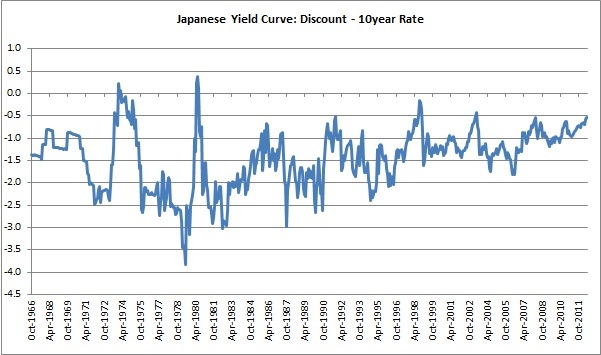 We will take a look at the Japanese yield curve to examine the claim. Japanese interest rate policy has been loose for a long time now, as reflected by the negative slope of the curve. However, this has somewhat moderated in the last 20 years, following more extreme policy in the 1970’s and 1980’s. Japanese monetary policy has not been particularly loose relative to other countries over the last 20 years. The United States had an average yield curve slope of around –1.6% vs. –1.2% for Japan over the last 20 years. Thus, the West would have to follow more conservative policy to have the dubious honour of following Japan. Although the short-term rate has been lowered very aggressively by Japan, the natural rate of interest as proxied by the long-term rate is also low. This suggests that monetary policy has not been as relaxed as suggested by looking at the low short-term rate in isolation. In contrast, recent US policy, over the last decade, has been highly simulative. In both the 2002-2004 loosening and current loosening, the US yield curve slope has reached close to -4%. The Fed has forced the short-term rate substantially below the natural rate, in contrast to more conservative policy in Japan, as revealed by the Japanese yield curve. The variable to consider, when thinking about possible monetary policy changes in Japan, is the CPI rate. The central banks consider the CPI to be a measure of price inflation and usually target some rate of CPI increase; which is deemed to be acceptable or even desirable from an economic perspective. 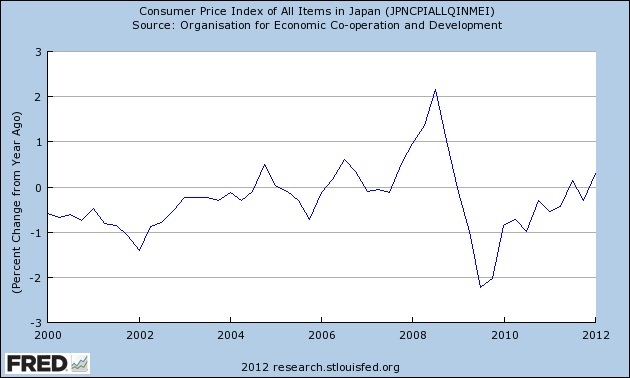 Japanese CPI reached dizzying heights in the 1970’s, at one point going well OVER 20%. This was the time of the real estate boom in Japan. However, CPI has been more muted of late as the bubble burst. Aside from a spike up towards the 2% level in early 2008, the CPI has most often been hovering around zero or below. With Japanese CPI currently hovering around the zero level, it suggests the central bank will REMAIN ACCOMODATIVE. It would be difficult politically for the central bank to raise short-term rate and flatten the yield curve under these conditions. The population would accuse the central bank of not doing enough to encourage growth and employment. Therefore, we should not expect the Japanese yield curve to be flattened until CPI picks up. The slope of the Japanese yield curve suggests monetary policy has been fairly neutral over the last 20 years. This seems counter-intuitive as the Japanese short-term rate has been so low, but this has been offset by a low long-term rate. The West has not been following Japan in recent years with ultra-loose monetary policy. Their monetary policy was already more aggressive than Japan and since 2008, it has taken an extreme turn. We cannot look to Japan and hope that the West will muddle through for the next 20 years as Japan has. Examination of the yield curve suggests the West will have a far worse experience than Japan when policy is inevitably tightened.